Mother Nature sent way more sockeye back to Bristol Bay than was expected, and many fishermen recorded their top seasons ever. As other fisheries fall short, the market is eager for all the fish the Bay can provide, so the fleet goes home with a better price, too. The ex-vessel value may be the highest since early 90s. 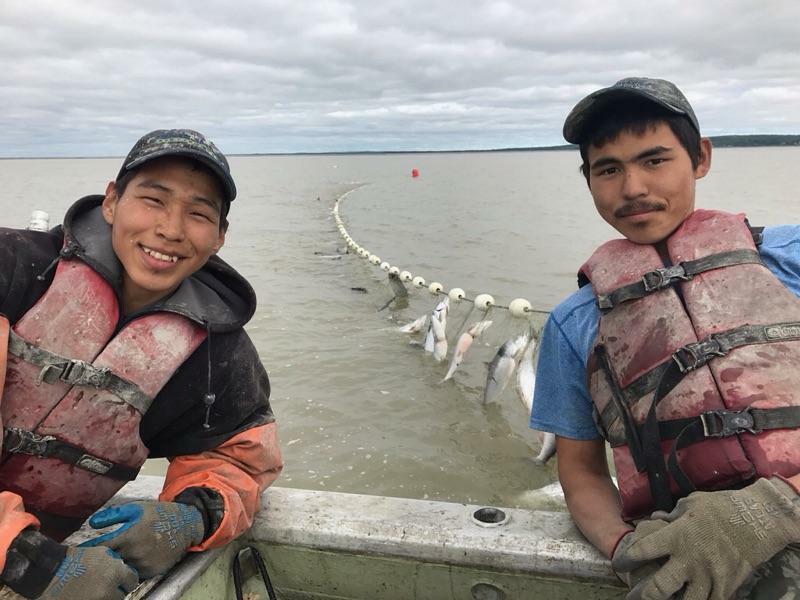 Harvey Nick, 19, and Cuk-Ayak Olick, 20, two Bristol Bay set-netters from Kwethluk, were enjoying another big harvest day near Dillingham late last week. The Bristol Bay run is not over yet, with word Monday that the Kvichak River seemed to finally “pop”, but this year’s fishery is shaping up to be one of the largest ever and certainly one of the most valuable in a long time. The total run was predicted to be 41.5 million, allowing for a harvest of 27.5 million sockeye, but through Monday the fleet had hauled in over 34 million and the total run was already past 51 million. “This is a year where the more fish the better,” said Andy Wink, a senior seafood analyst with the McDowell Group who closely follows salmon markets. Bristol Bay’s big buyers settled on a base price of $1.00 per pound for sockeye in 2017, up from $0.76 per pound last year. Many fishermen will see a $0.15 cent bonus for chilling, and some will see five to ten cents more for floated and bled fish. "We are really happy to see several processors posting $1/lb base price - especially considering the base price just 2 years ago was .50 cents," said Bristol Bay Regional Seafood Development Association executive director Becky Martello. “With much of the fleet now chilling and bleeding, it means that our fishermen can get upwards of $1.25/pound. That's good news for the fleet and the fishery." Eric Olson and his crew on the F/V Aventura fishing the record Nushagak year. Olson's crew bleeds their catch before floating them in RSW till delivery. Nowhere has the run differed more noticeably from the forecast than in the Nushagak District. The state’s preseason estimate was 8.6 million, but through Monday the total run was 18.7 million, an all time high, and still counting. “This has been a sight to see. I mean, the greatest migration ever of salmon ever to the Nushagak District and I lived to see it. And you know it’s kind of a wonderful thing,” said Curtis “Ole” Olson, a 37-year veteran of the west side set net fishery. Tim Sands, the state’s area management biologist for Bristol Bay’s west side districts, has fished the fleet nearly wide open all season. Still, the Igushik, Wood, and Nushagak Rivers have all counted sockeye well past the top end of the escapement goal range, known as “over escapement”. The district has set at least four records this season: highest total run ever, biggest harvest ever recorded, first day of more than a million sockeye caught (which happened twice), and most fish ever tallied past the Wood River counting tower (already at 4.1 million). The Nushagak sonar has counted 2.8 million reds, the most upriver since a strike year in 1980. 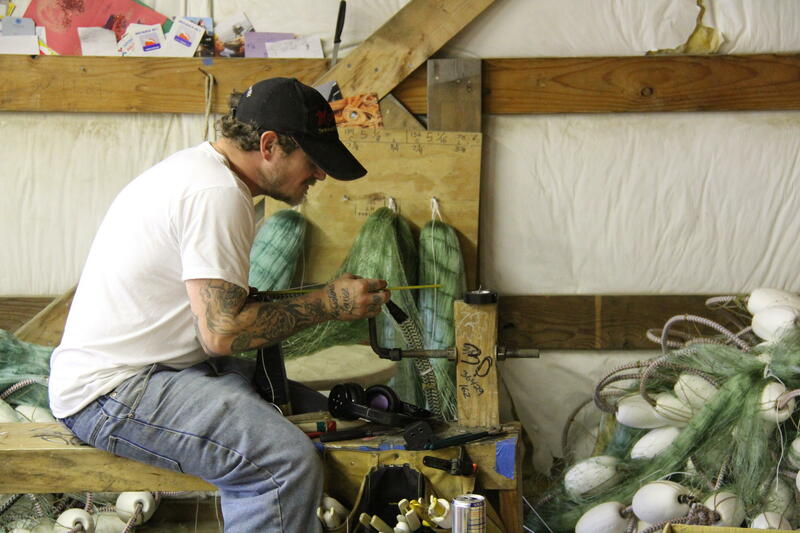 He pointed out that it will probably be the best set net year ever for the district, and drift boat after drift boat have reported back that this will be their biggest season ever, too. It’s possible other records will be set when fish tickets are logged in the months ahead. The famous Nushagak king run was the exception to the excitement as it fell way short of expectations but still reached the 55,000 minimum escapement set by the state. Robert Buchmayr, skipper of the F/V Okuma, is not one to seek a media spotlight but is generally regarded as one of the top highliners in the Nushagak District. 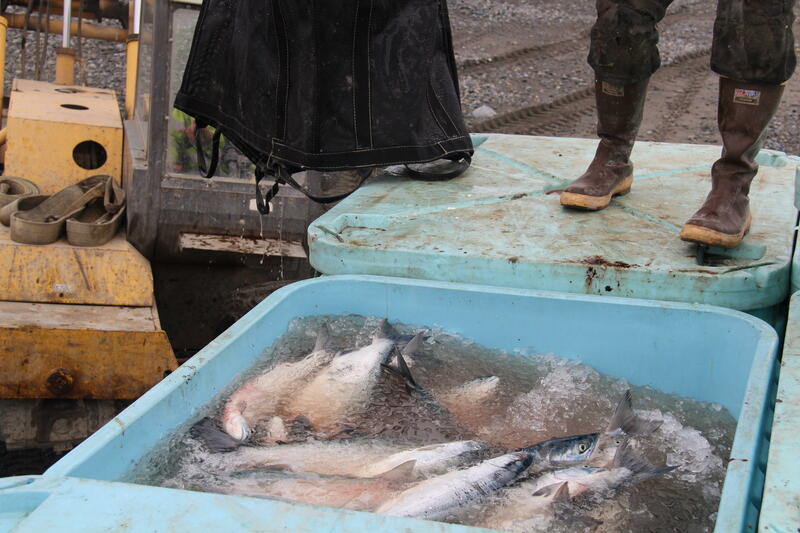 The huge harvests in the Nushagak contributed to the plugging up the Bay’s buyers, who struggled day after day with more than two million salmon to process. Most fishermen had catch limits for a big portion of the season. On Monday, July 3, the Bristol Bay fleet hauled in a combined 3.1 million sockeye, the first time over three million since July 2, 1999. “Looking back historically since 1980, we identified eight times where we’ve had a harvest of three million fish in one day, so it’s a pretty rare bird,” said Jack Erickson, the state’s Southcentral commercial fisheries research coordinator. Rare, but not the biggest ever. “Believe it or not, we had a 5.2 million day on, again, July 2, out of 1993," he said. Egegik has gone well past its preseason forecast also, up to 13.1 million sockeye through Monday, and tallied two of the biggest daily escapement days ever. The Ugashik District fleet had an agonizing wait for fishing time, and by the time the sockeye pushed inshore, a large number of boats had moved in from Egegik and the Nushagak to get in on the tail end. At the state’s last count on July 17, there were 412 drift permits registered on 314 boats in the district. Naknek beach set net fish floating in a tote with ice water for delivery. The Naknek-Kvichak was this year’s wild card, again, arriving late and possibly smaller than expected by several million fish. But on Monday, both the fishing and the weather picked up considerably. “12-16' waves last night. Left fish because it was too rough and anchored in the river. Glad it's come down, about ready to set the net again,” Everett Thompson of Naknek wrote on Facebook Tuesday morning. The total run to the district through Monday was 13.5 million, still shy of but inching towards the 16.1 million preseason forecast. All the managed rivers, except for Togiak which is normally runs later, have met or exceeded their escapement goals. With the extra large returns to the Nushagak and Egegik, 2017 has become a huge run, much bigger than expected. “Well I think it’s pretty clear at this point that we’re going to crawl above the 50 million level, and if I had my nickel in there, it’d be falling somewhere in the 52 [million] range,” Dr. Curry Cunningham predicted on Thursday, July 13, when the run had just crested 43 million. Cunningham and Chris Boatright analyze the run for the University of Washington’s Fisheries Research Institute. Based on the size of the harvest and the base price of $1 per pound, the ex-vessel value should be noticeably higher in 2017. The bigger volume going out fresh, the improvements to percentages of chilled and bled fish, and better labeling are all helping raise the value of Bristol Bay’s wild-caught sockeye in the market. He believes especially domestic consumers are eager for the added harvest coming out of Bristol Bay. Delivering a bag of chilled, floated, bled sockeye. Getting ready for next year. At LFS in Naknek, Saturday July 15.